At Kinbrook, our purpose is to help you utilize the power of promotional products to keep your customers coming back to your business. Over 19 Years of Industry Experience. Delegates Conference Accessories has been using Kinbrook Doming for approx 5 years now. In this time, we have found them to not only have an excellent product, but they take an interest in what/ who we are purchasing for. They have offered alternate options if they though it would be helpful. This shows us they are genuinely interested in helping their clients and this is a number 1 priority for us. We need and demand excellent customer service and flexibility. Kinbrook supplies both these as well as an excellent product. They have very good turnaround times and speed of delivery. On top of these, they are a small business that takes an active interest in their local community and this is in direct alignment with Delegates values. If you want complete peace of mind, then you can’t go past Kinbrook. Great turnaround and service from Kinbrook… Quality is good too and I’m sure we will order many thousands of inserts this year… I am a 34 year old small business operator. 3 staff, 4 kids and a great wife thankfully… But busy as you would know. Similar to Kinbrook we aim to use technology (email / internet) to streamline business and offer our customers great prices. The no setup and low cost of centres initially intrigued me to give it a go… Hopefully we’ll repay this through repeat orders. My Name is Matthew Colagrossi I am the proprietor of Corporate I.D. We have been in business now for 8 years. Corporate I.D. provide uniforms & promotional products to businesses, industries, schools and associations and we are currently growing at a rate of 5% per annum. Our success and longevity is based on promoting value for money, exceptional customer service, on time delivery and ultimately customer satisfaction. This being said, we ensure our quality and growth by carefully choosing and only utilising the services & products of suppliers who adapt the same principles as we do because ultimately, this reflects on our business which affects our bottom line. With Kinbrook, we are assured to be looked after in a professional manner because Kinbrook take care of all their customers and offer a quality product at a competitive price. After dealing with other suppliers, I soon realised that there was no comparison between them. Kinbrook really are the doming specialists. Just want to thank you for the service that you provided to us. You were so helpful when I rang, and guided me through the prosess. The turn around was so fast and the quality awesome. Our client was impressed with the product and the price. We look forward to working with you on many more jobs, and thank you again for your great service. As a designer, I love your domed stickers. The quality and finish is beautiful, and every client we have shown them to wants to work out how they can use some. Your service matches the quality of your product. Each job has been delivered quickly and reliably - and we haven't even needed to request quick service. Thanks for another great job, and we look forward to many more. Our business was referred to Kinbrook only 2 weeks ago and their service has been amazing in this busy time of the year. As we are a new customer and have no past history with Kinbrook they would have been within their right to have us wait for our orders, but no , on the contrary they filled our orders in plenty of time and with a standard that could not be faulted. My thanks to Nicky and to you for great service. My products arrived in record time and they are every bit as good as I wanted. Nicky is fantastic, quotes arrive quickly and your follow up is terrific. I’m almost ready for my next order as these look fantastic on items I supply my clients. Kinbrook's Australian shaped Christian magnets have been used effectively in our mission work in Japan over the last two years. These magnets with Australiana pictures on them are one of the few souvenirs available that are actually designed and manufactured in Australia. We would also like to thank you for 'bending over backwards' to meet our requirements and for making our priorities yours. Congratulations Robert on a wonderful concept and product. very proud of you I am!!! Just a quick email to let you know that I received the magnets a while ago, they look great. Thank you for your hard work and prompt delivery and I look forward to ordering this and many other items from you in the future. Dear friends, A very quick email to thank everyone who responded to our request for donations of second hand English readers for the Shibuya school in Tokyo. We have been blessed to come into contact with the manufacturer of the Australian magnets that we took over to the school last year. Not only has he provided us with 200 magnets ..., (Australian shaped with pictures of Kangaroos and Koalas and Matthew 7:7 written on them) but he has thrown in numerous stickers and some New Testaments for us to take. Thankyou and bless you Robert. Just to say I have received the magnets and they are fabulous!!!! 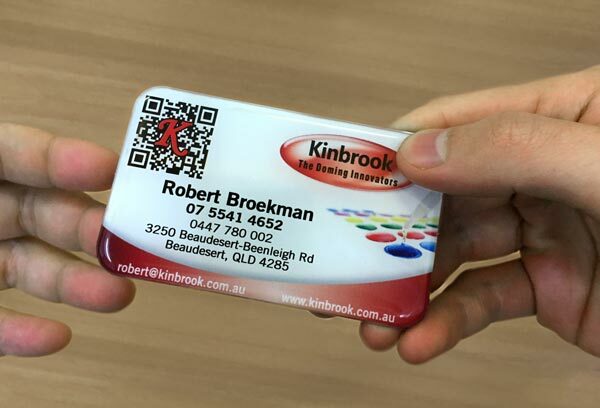 Kinbrook owner/operator Robert Broekman works closely with his design team to create custom branding and promotional products for a growing number of companies and organizations Australia-wide. He has recently extended his operations into the international market, offering wholesale rates that compare favorably with competing suppliers in South East Asia. Born in New South Wales, Robert has called Queensland home for the past 40 years, and lives with his wife on a rural property outside of Beaudesert. He began his custom promotional products business 19 years ago after retiring from his highly successful home improvement service. To learn how Robert can help you promote your business, spend some time browsing this site, and be sure to read the information on our Articles page. "Are You Wasting A Fortune On Ineffective Advertising? Keep Your Business Message In Front Of Your Customers Every Day With Domed Promotional Products." Do you realise just how effective branding and promotional products can be in marketing your business? First, consider why advertising is regarded as such a crucial component in the success of a business. It's because, in a competitive marketplace, every business runs the risk of being quickly forgotten once a transaction has been completed. How do you keep your name and/or business logo at the forefront of your customers' awareness? The answer lies in a single word: branding. Large companies spend millions of dollars annually to keep their products and services in the public eye. And a big part of their advertising campaigns is designed to create their public image – and engender trust in their brand. But what's the answer for a small business with far fewer dollars to throw away on billboards and television ads? By adding custom designed labels and stickers, your products will advertise your company long after they've been delivered to the customer. This type of branding, utilising quality domed resin labels and stickers, is an effective, low-cost method for promoting your products and services to your market. You can use domed resin promotional products for more than just market visibility. Custom magnets and key rings, presented to your customers as small tokens of appreciation, can create a real sense of being valued. Everyone loves receiving a no-strings gift, especially if it's unexpected. And along with your quality products and services, this will help inspire a sense of loyalty towards your business. Branding plus trust – a winning combination. Here's an additional benefit to offering free fridge magnets to your customers. While business cards may be lost or misplaced, custom fridge magnets are more likely to find a permanent home in your customer's kitchen or your client's lunch room. So the next time they need the products or services that you offer, your name will be right there to jog their memories. When it comes to domed products, you've found the right web site. Not only can we help you with your business needs, we also offer personalised items such as magnets, key rings, jewellery and trophies. You can rest assured that we won't rush your job for the sake of expediency. We'll take the time to make sure you get the exact look you want, with the eye-catching finish that will make your products stand out from the rest. But that doesn't mean we'll take weeks to fill your order. Tell us when you need your products and they'll be ready on time. You can stop wasting money on poorly performing ads by using promotional products to bring your customers back, time and time again. You can also use them to offer incentive discounts and bonuses to both current and potential clients, attracting new customers for very little outlay. You won't be left to fend for yourself when it comes to utilizing your promotional products. Read through the Business Articles on our web site to stimulate your ideas on effectively using magnets and other promotional items to promote your business. To receive a product overview please fill in your details below. At Kinbrook, our purpose is to help you utilize the power of promotional products to keep your customers coming back to your business, rather than to your competitors. We'll work with you to create your own custom promotional products. You can supply your own artwork or contact our graphic design team to develop the most effective images for your promotions. And to assist you in your quest for greater profits and business success, you'll find several helpful articles from our files on the Business Articles Page. To discuss your ideas for promoting your business with domed promotional products, please contact us by phone, fax or email.